Having used the Choetech Nightlight the past several weeks, I have no problem in recommending it. 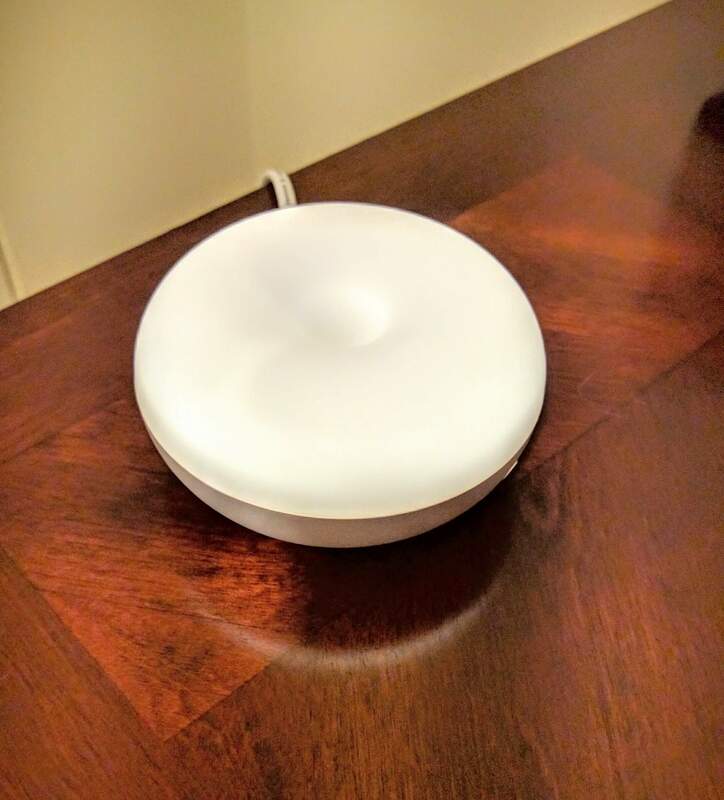 It fits a unique need for many by providing a nice, soft nightlight for a room while charging up to two devices at once. This would be a great addition to a room for a teen or a college dorm student. While the charging ports are slow compared to some USB chargers, keep in mind that this is designed to charge your phones overnight. They don’t need to be fast, just safe and efficient and that, this product does well. also has eyelets on the base so you could hang it on a wall easily too. On the base edge you will find the figure-8 power connection along with the two USB Type-A ports. Each port can output 2.4A of energy and you can charge two devices at the same time. Opposite of the USB ports is a small power button which enables the sensor – the small hole next to the power button – for dusk-to-dawn control. Inside the nightlight is a 1W LED chip that, thanks to the translucent dome, provides a soft, even lighting effect across the dome. Because it is a low power LED, it consumes very little energy to run and likely would never need to be replaced. The outer materials of the Cheotech Nighlight are made of ABS+PC fire retardant materials. This means that you can feel comfortable about putting this in a child’s room or other location where it won’t catch fire. The design very much fits in with just about any decor. It is small and designed with minimalism in mind. There aren’t any extra buttons and the dome and base make a nice, puck-like product. As a nighlight, this product is excellent. The combination of the frosted dome and the 1W LED chip in it produces a nice, even light across the dome that is soft and easy on the eyes. It also isn’t overly bright. You can put this in a dark room and fill the room with a soft light that won’t distract most people from going to sleep. Yet, it is bright enough so you can see around the room if you need to do so. In my testing for this review, I found that the dusk-to-dawn sensor worked very well. As soon as there is enough light coming through the windows, it shuts itself off, saving energy. Most readers are likely interested in the performance of the USB ports on the Choetech Nighlight. I can say they work well and there is no problem in using both ports at the same time. Across the two ports there is 5V of energy and 2.4A per port. That means that when you do connect two devices, the charge is a trickle charge. In other words, it isn’t going to be very fast. But for what this product is designed to do – charge your devices while you sleep – that is just fine. During my testing, I depleted my Nextbit Robin down to 5% of battery and had the nightlight charge it overnight. When I woke up about 7 hours later, the phone was completely charged and ready to go. For my next test, I depleted the Robin back down to 5% as well as my Nexus 9 tablet to about 10% of remaining battery. Again, both devices were charged by the time I got up. Having used the Choetech Nightlight the past several weeks, I have no problem in recommending it. 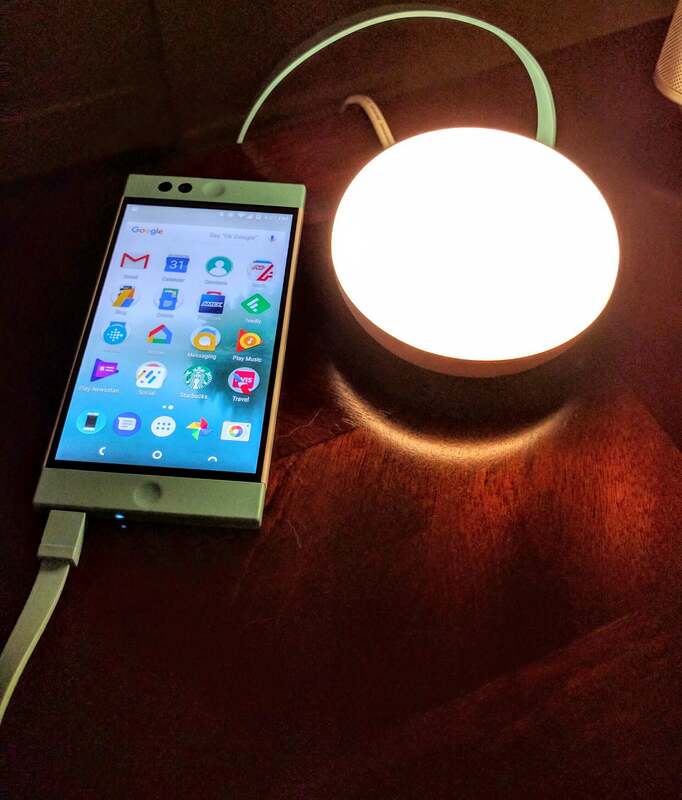 It fits a unique need for many by providing a nice, soft nightlight for a room while charging up to two devices at once. This would be a great addition to a room for a teen or a college dorm student. While the charging ports are slow compared to some USB chargers, keep in mind that this is designed to charge your phones overnight. They don’t need to be fast, just safe and efficient and that, this product does well. The good news is it won’t break the budget. It is only $13.99 on Amazon.